CUSAT Previous Year Paper: Cochin University of Science And Technology (CUSAT) offers admission to BTech, LLM, MCA, LLB, MSc, PhD, BCom, MA and many other courses. Admission to CUSAT is done through the Common Admission Test (CAT). If you are planning to take this exam, then must check the Previous Year Paper to score well in the exam. Here we have provided the direct link to download the CUSAT CAT Previous Year Papers so that you can easily access the paper and get an overview of the original question paper. You can click on CUSAT CAT Previous Year Paper Download link to get the previous year’s question paper for different courses offered by the university. You can also visit the official website to get the question paper download link for all courses. CUSAT CAT BTech Question Paper will include questions from the Mathematics, Physics & Chemistry subjects. The Paper will be of objective type containing 250 questions. Out of which 125 will be from Mathematics, 75 questions from Physics and rest of questions from Chemistry. The official authority has not made any announcement about the exam date, but candidates are advised to start preparing for exam as soon as possible. You need to go through the Last Year’s Question Papers to get an idea about the difficulty level of paper, important topics from which questions will be asked, marking scheme, type of questions etc. 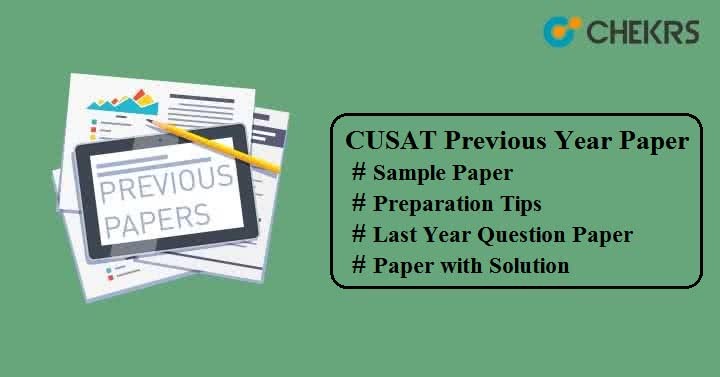 After completing the entire syllabus, candidates should practice CUSAT Sample Paper to give perfect finish to their exam preparations, to boost up their confidence level, to analyse their knowledge and to improve their efficiency to solve the questions. After getting all the required papers you will need some tips to do your best. So here are the few preparation tips for you. Manage your time and give equal time to all the parts of the syllabus. Be Updated With the CUCET Syllabus and also use good study material. Make Sure to Complete your Syllabus on time to get enough time for revision and solving these Papers. Timely Revision is the key factor so must do revision after completing the syllabus and solving the Papers. Sleep well, Take proper gap and rest, and be healthy. Still have any query regarding CUSAT Previous Year Paper, do comment in the comment box below.